"e;Deliciously hilarious. If you care about people and enjoy a good laugh, I politely encourage you to read this book. Immediately. "e;--Adam Grant, bestselling author ofOriginalsFrom the brilliant comedic mind behind the hit movieYes Man, a hilarious and pitch-perfect look at the rudeness that's all around us -- where it comes from, how it affects us, and what we can do about itYou're not … just imagining it: People are getting more and more rude - from cutting in line, gabbing on their phones and clipping their nails on public transportation, to hurling epithets on Twitter and in real life (including a certain President who does both). 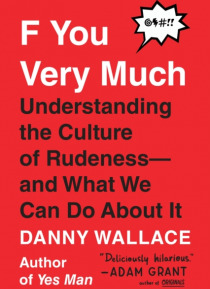 And the worst part is that it's contagious, leading reasonably courteous people to stoop to new lows in order to respond to the ever-coarsening encounters we face every day.In this engaging and illuminating new book, bestselling author and all-around curious guy Danny Wallace looks at the reasons behind the rudeness, and what we can do to stop it. His quest to stop the madness includes interviews with neuroscientists, psychologists, NASA scientists, politicians, and other experts. He joins a Radical Honesty group, talks to LA drivers about road rage, and confronts his own online troll in a pub--all to better understand the scourge that's turning normal people into bullies, tantruming toddlers, trolls, and other types of everyday monsters.Want to be part of the solution? Let Danny Wallace be your smart and funny guide.